"Every Dental Service Your Family Needs"
For so many years, you suffered from missing teeth and wondered if you would ever be able to regain any of the function and self-esteem that you once knew. Then you were fortunate enough to receive new dentures of Sapulpa, which immediately made you feel a million times better. Recently, though, you’ve noticed that your prosthetics feel loose and unstable when you’re wearing them. You desperately need a remedy to this problem because you can’t imagine going back to life like it used to be. Thankfully, your local dentist has some options for you, which you’ll discover as you read ahead. Relining – This process begins with lightly adjusting the tissue side of your appliances to remove debris and recreate a fresh surface. Then your dentures are immersed into a new resin compound, and the new material is trimmed to produce a set of prosthetics that fit like new. Rebasing – The rebasing process involves replacing the current denture base material with a new one, producing a more secure fit on the bottom of your appliances. Remaking – A remake is a completely new fabrication of your dentures. Another alternative that you have, is implant-retained dentures. This offers the benefits of having a sturdier foundation for your prosthetics to rest on, while affording you the convenience of being able to remove your teeth. Whereas traditional dentures rely on an adhesive to hold them in place on the bottom and suction to secure them on the top, dental implants of Sapulpa bypass that because your appliances will be held firmly in place either by snapping to buttons or attaching to a bar on your implants. Therefore, you won’t have to worry about your dentures slipping, falling out of your mouth or irritating your gums. Better Tasting Food – You will be able to better taste your food because your palate will not be covered like with the traditional denture method. Better Jawbone Support – The implanting process provides far more support and tension for your jawbone, which triggers it to produce more new bone cells and prevent facial collapse. Better Speech – You will be able to speak with more clarity with implant-retained dentures because of their more stable fit. 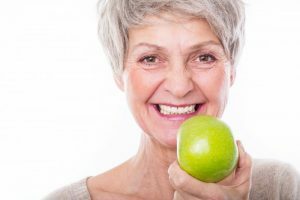 To learn more about these options, contact your dentist in Sapulpa to schedule a consultation so that you can have the issue with your loose-fitting dentures corrected and regain confidence in your smile. Dr. Parnam Mohanna received his undergraduate degree from Oklahoma State University and would later go on to earn his Doctor of Dental Surgery degree. A Fellow with the Misch Implant Institute, a Diplomate and Fellow with the International Congress of Oral Implantologists and receiving advanced training in dental implants from the Las Vegas Institute, Dr. Mohanna has a wealth of knowledge and experience. He practices at CCCD and can be reached for more information through his website.